My brother, a keen windsurfer stayed with us last weekend and obviously the conversation turned to canoe sailing. I was a little disappointed when his comments suggested that canoe sailing was a compromised form of sailing rather than something pure. A kind of "Jack of all trades, master of none" situation. I tried to stand up for the trusty canoe and reminded him that canoes were the original boat that started everything else off! Okay why mention this? Well I am kind of hoping that someone can give me something to counter his view, to show him that sailing canoes can sail as well as any other good sailing boat or dinghy. Perhaps a YouTube video of a canoe out-sailing a windsurfer or traditional sailing boat or photo of a sailing canoe barely touching the water as it goes by in a force 12 or something! I tried to say that the speed of a sailing craft is determined by the size of the sails, the weight of the boat/canoe, the drag in the water and the ability to keep the sail upright. In other words, fit a big enough sail to a canoe and it should out perform a windsurf board in certain conditions. That's like asking a tanker to run like a speedboat. Canoes can sail with more than one person and with camping equipment. Last time I looked, windsurfers weren't suited to that sort of sailing. Also consider that one could sail a canoe all day, eat lunch on board, and still have energy to set up camp and cook at night. Windsurfing is more tiring and at the very least you'll spend the day standing on wet feet. They're just so different I think competing is pointless. Each to their own. Near Banbury, England and just South of Poitiers France. Not sure about out-sailing a windsurfer, but for performance under sail there's probably no canoe that will beat the International 10 Square Metre Sailing Canoe. Look closely, the hull is just over a metre wide, it's a real canoe under there. I haven't sailed one for years, windsurfers were in their infancy then, but I do remember it was exciting! 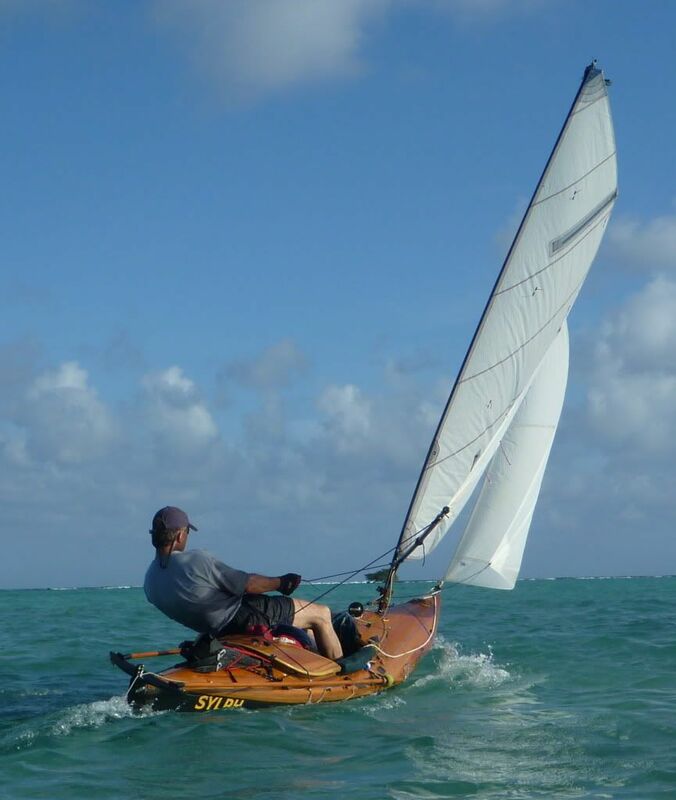 Agreed on the International 10 Square Metre Canoe... claimed to be "the world's fastest single-handed monohull sailing dinghy"
Whooooooor, LOVE IT!!! Cheers for digging this out Greg. Now that's what I'm talking about. You can't argue with that. No way he can say canoe sailing is pathetic now. I can't imagine many sailing boats keeping up with these if I'm honest. Makes my Enterprise look like it's stuck in reverse! I agree with Bhofman, Sailing canoes are best because they are easily portable ,go anywhere, carry loads of gear, and can be fun, responsive, fast sailing boats, that you can also paddle when the wind dies. I call that versatile. I've never seen one of those moths up close... but would love to: awesome looking craft! The International 10 square meter sailing canoe seems to suffer from being classed as a canoe rather than as a dinghy: performance wise, I get the impression it should be at least as well known and popular as the 505, Fireball and RS660.... but I'm assuming they all fit more squarely within the sailing world and RYA pantheon. Moths are not very good for paddling. In the dim and distant past I sailed an International Canoe. They've never been very popular because they're bloody difficult to sail well and the learning curve is pretty steep. I was young, keen and didn't mind swimming regularly. Are they a canoe? In name only really. The hull shape has evolved beyond a paddling shape to a form designed to go fast under sail, very different things. I've been lucky enough to have crewed and helmed a lot of high performance dinghies including Cherubs, Int14's, Merlins, Flying Dutchman formula 18 cats etc and I think the Int Canoe was the most satisfying due to it's difficulty. The Canoe was the fastest singlehander, but a foiling Moth will leave it for dead in the water. If you get a chance to sail one, have a go, you wont forget the experience in a hurry. Japanese Aquamuse going rather well, and is that a windsurfer in the distance? Hmm......You could be right Dave. I'm not sure I could paddle one onto the foil either. My paddles would be too short to reach the water! What are the International 10 Square Metre Canoes like for paddling? A bit different from most OCSG craft! The more meaningful and constructive discussion here would be about the performance of easily paddled sailing canoes designed and built for recreational tripping and cruising: I can understand those with a background in windsurfing and in performance dinghys having doubts about the rewards that might come from trying to sail a typical Prospector or Penobscott retro-fitted with a rig, leeboard and rudder! First up, we should perhaps point to performance of decked sailing canoes that are designed to be versatile, paddleable cruising craft. I'm assuming that Howard Rice's Sylph fits squarely into that bracket, as might the raptor: I couldn't see many dinghy sailors finding either sailing canoe tame! Of course, with the 40" beam and outiggers, the classification as a "canoe" gets pushed to the limit: we're into craft that CAN be propelled by paddle... but preferably with a double blade and renouncing the skillset and performance that a paddler might see as fairly fundamental to what "canoeing" is all about - but I doubt most dinghy sailors would find much to quibble with when it comes to under-sail performance... and those outriggers are not compulsary! I suspect that covers the main categories of specialist sailng canoes which could be described as lively and fast... but the common characteristic is that they are specialist: what's scarce is evidence of serious performance from a canoe that retains the key characteristics of a paddler's boat - I've hard the tales, but we could really do with video footage of converted open canoes (that are good to paddle) being sailed hard (without outriggers) in strong winds! Of course, all of this is a world away from what many might find appealing or might ever want to contemplate tackling... but canoes sailing needs to be a broad enough church to embrace the folk who like a lively, performance sailing canoe as well as those whose ideal is a potter with a small sail in a stable boat propelled by no more than a force 3! ps. I appreciate that mucking about with video cameras might be a low prority when on the edge, without outriggers, in an undecked open canoe, in seriously strong winds: I'm noting what would be nice to have as footage to show doubters, not doubting that such sailing happens, or implying that those who've been doing it should have been doing so with a video camera in one hand! Last edited by GregandGinaS; 18th-May-2011 at 10:46 PM. I believe the modern sailing canoe can be (and in my case) is 100% a sailboat and a very fast one at that. Because I might paddle my canoe does not in my mind mean she is not a sailboat. I find the paddling aspect has nothing to do with whether a sailing canoe is a canoe or a sailing boat. Sylph is a sailing boat. I find the modern sailing canoe ride to be on par and in my humble opinion superior to the feel and experience of many small sailing dinghies. If I didn't I wouldn't be a canoe sailor. The versatility is key. I can paddle my cruising canoe long distances in flat calm. I can also paddle Sylph in very tight quarters such as exploring mangrove channels, narrow estuaries, rivers, maneuvering between docks, etc. I can handle her easily under sail, under paddle, on land and single hand her on to a car. 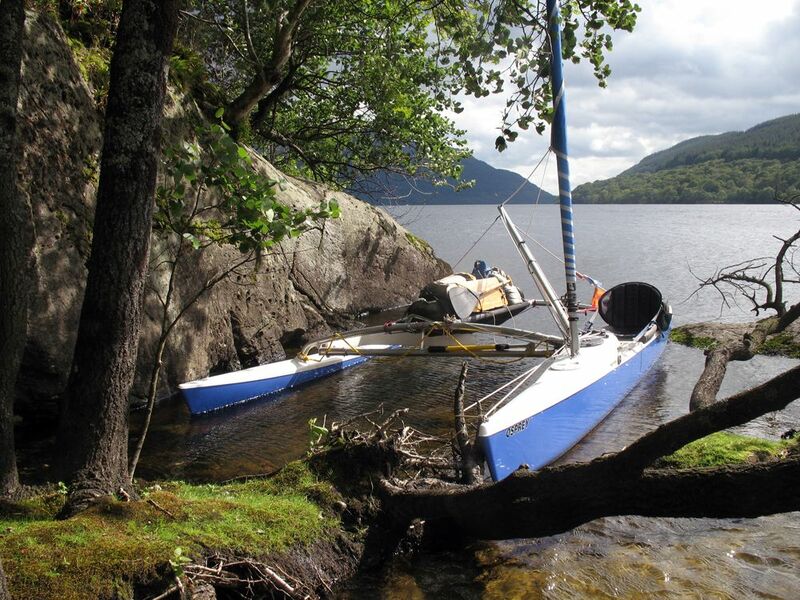 The modern sailing canoe can be set up to be simple and easy to self rescue and not only self rescue but to quickly sail away from the capsize. In a breath of wind I hoist sail and my canoe ghosts along in almost undetectable wind. At times I cannot read anything on the water surface and yet she is sailing beautifully. When the wind cranks up to force 6 and slightly above (I have sailed her in force 7) reefed down a good canoe design and a competent sailor can fly and the intimacy of actually being right at the water/air interface is unlike any experience I have had in any other small boat other than a sailing folding kayak. I am a small boat sailor. Show me a dinghy that is able to be sailed, paddled with a double blade, can get up almost any trickle of water resembling a stream, can handle a load and is believe it or not very stable and I will drop canoe sailing and sign on. I have for the first time looked at the Solway Dory site and know you folks across the pond have some excellent sailing canoe choices available to you. Nearly all the video footage that i have taken of sailing canoes has been hanging out over the gunwale, sailing with one hand and shooting with the other. In steady wind i can manage this in strong winds but usually when it starts to get really interesting, the camera goes away and i have to concentrate on the sailing. The other problem is that if you are sailing along in the same direction as your subject the sense of speed is diminished. If you manage to get in front, turn round and sail back in the opposite direction you can get a short clip as you fly past the other canoe. But then you can spend at least a hour trying to catch them back up again. Understood, Dave... and you've not mentioned the biggest issue that you've faced - the obvious person to be filming (as in, pointing the camera at) in those situations is your good self, as you're the one most likely to go out sailing fast and getting sparkling performance from a conventional open canoe which might be stripped down in 3-4 minutes to be ready for a river expedition with paddling on rapids, lining/tracking, poling/snubbing, shoulder-portages and the rest! there has to be an opportunity at an OCSG meet to record some fast canoe sailing footage. These long narrow hulls break free of their waterline speed constraints much earlier and far more easily than wide beamed sailing dinghies. It's not "planing" as such, but the same as cats - they leave the displacement wave drag behind. Just two weeks ago, sailing in about 17 knots, my Shearwater was "planing" , breaking free from displacemnet drag just so easily. It made an old man very happy. Here's a picture of Hugh out in his new Bufflehead for it's first sea trials. look to the left hand edge of the photo and you can see Hugh's left a rooster tail some way behind. She flying along, even though the reef is not tied in well. Fast? Yes, we do fast! As already mentioned and "stating the bl**ding obvious" it's really hard to get the footage when the conditions are producing the performance wanted. Chris, I too am a keen windsurfer and I can confirm that a modern windsurfer does give sparkling performance across the wind. Modern "Freeride" and "Freestylewave" boards (the most popular and accessible types of boards) will achieve 20knots even with a duffer like me sailing them and more specialist "Slalom" boards will crack the 30knot barrier. The key phrase in the passage above is "across the wind", most windsurfers aren't designed to do much more than go really fast on a reach. Getting upwind takes some skill combined with good windstrength and sailing downwind is extremely difficult. I think a lot of folks remember the old windsurfers of the 70s and 80s which were nearly four metres long, had dagger boards and would go upwind and downwind like a proper sailing boat but rarely plane. My longest board is 245cm long and the one I sail most is only 232cm long (neither have dagger boards just a large fin at the rear) and the hull is designed to work on the plane not as a displacement hull. If you want to make your point to your brother simply pick a largeish expanse of water and challenge your brother to meet you at some point well upwind for a cup of tea. Load your boat with stove, kettle, cakes, deckchairs etc then glide serenely upwind to said point, alight, put the kettle on enjoy several cuppas while watching your brother battling to get to your picnic spot. When he eventually arrives smugly hand him a cuppa and a cake, offer him a seat before packing up and sailing back dead downwind again and repeating the exercise at your put in point. 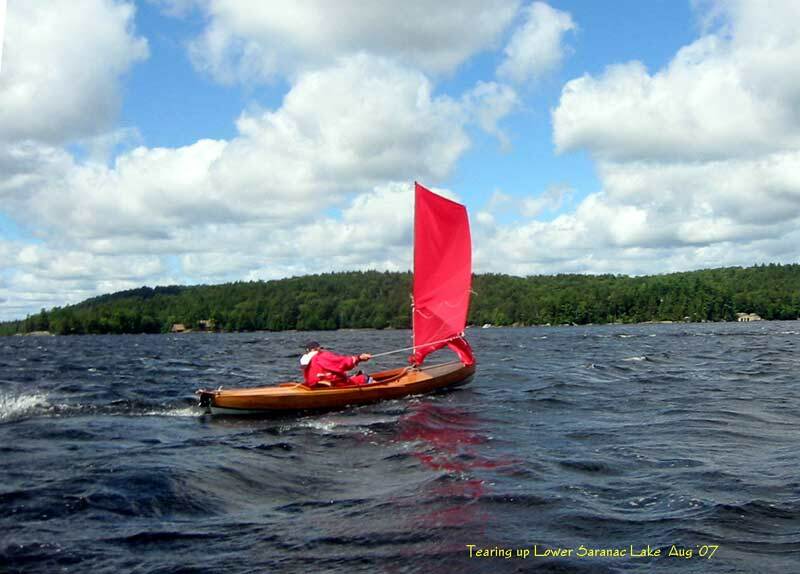 Your brother will probably have to use a big sail (maybe 8-10m) to have enough performance in lighter winds that'd suit your canoe so I can also guarantee that he'll be wasted from handling a big, heavy, clumsy rig as well. It's a long time since I did either, but I seem to recall I spent more time in the water trying to sail an international canoe than I did when wind surfing. Both seem to have evolved a bit since my time. Greg, I think your daugher would adore an international moth with her trapeze desires, they were probably the most fun I've ever had with a wetsiut on. Creeps off with zimmer frame. I seem to recall I spent more time in the water trying to sail an international canoe than I did when wind surfing. Will put it to dearest daughter... but I'm just jealous that you've had a go! Now that's a thought, kite canoeing. As teenagers one of my friends bought an international moth because you could pick an old one up for about the same price as a Mirror. We didn't realise just how difficult they were to sail but we had great fun finding out. I suspect that had a lot to do with the pricing. Anyone who had any idea what they were doing and was planning to sail round the Broads wouldn't have gone anywhere near a Moth. It is our childrens duty to push the boundaries as far as they can and age us substantially in the process. Then we realise that we probably told them about doing it ourselves in the first place. If I found my son eskimo rolling under flooded bridges I would probably go ballistic because it is such a stupid and dangerous thing to even think of. The outright speed sailing record is held by Yank kitesurfer Rob Douglas at 55.65 knots! Strangely I started out kitesurfing and progressed to windsurfing (usually it's the other way round). I enjoyed kitesurfing but I remember when I had my first lesson the instructor told me that even as an experienced kitesurfer he was only fully in control 80% of the time. There were times that it was pretty scary. That said modern kit is much more controllable than my stuff and it's MUCH easier to learn than windsurfing is. I prefer windsurfing because it's so bloody difficult, there's something addictive about tying to make that tiny step forward that is progress. I suspect that it's the same reason that golf is so addictive to some people. It's also nice to know that if I drop my rig it becomes fairly benign whereas when you crash kitesurfing the kite can remain powered up and will keep dragging you (usually upside down and submerged in my experience ).